LG Chem held a ground breaking ceremony for the construction of electric-car battery plant in Nanjing, China, to meet growing demand in the world’s biggest car market. The Nanjing battery plant, with an annual production capacity of more than 100,000 electric vehicles when completed by the end of 2015, will supply batteries to Chinese automakers like SAIC Motor Corp, Qoros and many other global carmakers in China. It was 'only' 7 months ago LG Chem's CEO said they were "considering" this EV plant in China!! 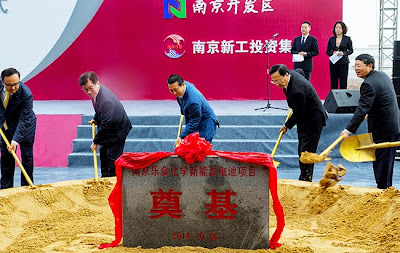 Among the key participants who joined the groundbreaking ceremony were Miao Rui Lin, the Mayor of Nanjing; Luo Qun, the vice mayor; and YS Kwon, the President of Energy Solution Company of LG Chem. LG Chem set up a joint venture in August with two Chinese state-run companies - Nanjing Zijin Technology Incubation Special Park Construction Development Co, Ltd. and Nanjing New Industrial Investment Group Ltd. - to start manufacturing EV batteries in China. LG Chem owns half of the joint venture while the other half is shared by Chinese partners. The Korean battery giant said it has been investing hundreds of millions of dollars into the factory and expects a total of 1 trillion won (AUD$1 Billion) in revenue by 2020, just by the batteries produced in Nanjing.